So a few weeks ago Morgan and I headed to the incredible city that is of course Rome. I bought Morgan a banging watch for our anniversary, he bought me a trip to a place in which I have dreamt about visiting for years. As a couple we're pretty good at presents wouldn't you say? As usual as soon as I found out, I started frantically planning my trip. Saving places of interest, eateries and cocktail bars to my Google Map and of course, thinking of the content. 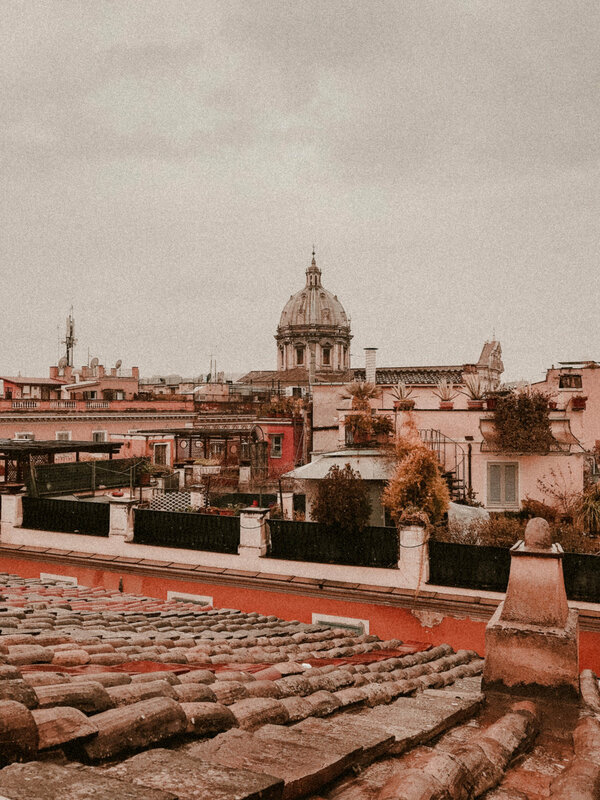 After a successful trip to Paris a few weeks before where I created two blog posts and a vlog, I was sure Rome would follow in that order too. The weather of course had other plans. Rain doesn't quite describe the incredible amount of water that fell from the sky that weekend. There wasn't really a moment that it wasn't heavily raining, all the locals told us 'this never happens, rainy Rome is rare' - mind you, little did they know a day after we departed they would get a covering of snow, which is even rarer in Rome! So anyway, after one day of taking my cameras out only to find my rucksack had filled with a puddle of water I resided to the fact content just wasn't going to happen and decided to enjoy my trip without too much concentration on documentation. I still wanted to write about it however, so I thought I'd write a few notes about our trip and include a few photos I snapped on my phone. We went for a Thursday - Sunday trip, arriving early on the Thursday morning and leaving late morning on Sunday. Whilst this definetly was enough time to see the sights, I definetly could of done a week in Rome... although I'm not sure whether the bank balance would of appreciated it. Morgan booked every part of this trip, which was super exciting for me. I'm usually the one forcing him away, dealing with the bookings and general organisation. Not this time, lucky for me I just got to pack my bags and go away awaiting for the suprises to unveil! So we booked into the Terrace Pantheon Relais, which was essentially a collection of suites with a breakfast service. It was a perfect balance between hotel and apartment, privacy, beautiful interiors and honestly such a good breakfast. I loved our room, it was huge and had the best tiled floor ever. Plus the shower was incredible for warming up after those seriously rainy days. We were keen to do a mixture of cultural sights and eating/drinking our way around the city. If I could recommend one thing it would be to sort your tickets out for the attractions before you came, whilst Morgan and I managed fie to get them online a few hours before - I just feel that by giving yourself the time to do them before you go away would make you budget a little better. Attractions can be pretty expensive in Rome, especially Vatican City! All in all Rome has only left me wanting to see more of the beautiful city and I would love to return in the summer months for definite. I can just imagine sipping an Aperol spritz on a balcony now. Do the touristy stuff: This goes without saying to most people, but this goes out to the people who are a bit like me. When planning a trip I never get excited for the landmarks, I just really really don't like being in touristy spots. I prefer seeing the city by how the locals see it usually. However, Rome is an absolute exception. The difference is, their landmarks are incredible pieces of history which can turn even the most uninterested person into a fanatic. I've become a little bit obsessed with Roman History since returning home. The colosseum was my favourite sight, i just couldn't get over the sheer size of it! Eat pizza by the slice: A strange recommendation I know, but an important one. Pizza is incredible in Rome, obviously - I knew it would be. What I couldn't quite get over is how delicious and cheap buying pizza by the slice is in Rome. Feeling peckish? Pizza by the slice. We tried both MATO and Alice Pizza - both were incredible and I still can forget the delicious taste. Don't judge a book by it's cover: Again, another 'me' thing when travelling is finding the most incredible interior driven coffee shops, restaurants, shops, etc. to experience. All about the photo right. Rome? Wrong. Whilst there were some truly beautiful places I saw - I also dined and drank in some places that looked like a front room. Do you know what? Trattorias are where it's at. If you didn't know a trattoria is a family run restaurant and that is exactly what you should be looking for when dining in Rome. You're guaranteed some incredible food and friendly service. Drink red wine and eat at the bar: I mean I don't need telling twice to drink wine at a bar but in case you do, I'm here to tell you to do so. I love how causal everything is in Rome, people eat late, people eat at the bar and chat away to the bar staff as if they are friends. It's an incredible atmosphere. One of the nights Morgan and I opted to eat a selection of food at the bar and drink merlot at the bar rather than heading out for a traditional dinner, It was fun and different. Eat gelato by the fountain late at night: One for my favourite moments of the whole trip was after dinner one night heading to get Gelato from Il Gelato di San Crispino and then taking that gelato and watching the Trevi Fountain all lit up. It was nearly midnight and the place was still buzzing, sitting and watching it in all it's beauty is just a memory that will last forever for me. Sorry it wasn't quite a city guide but I hope you enjoyed my little post on Rome!